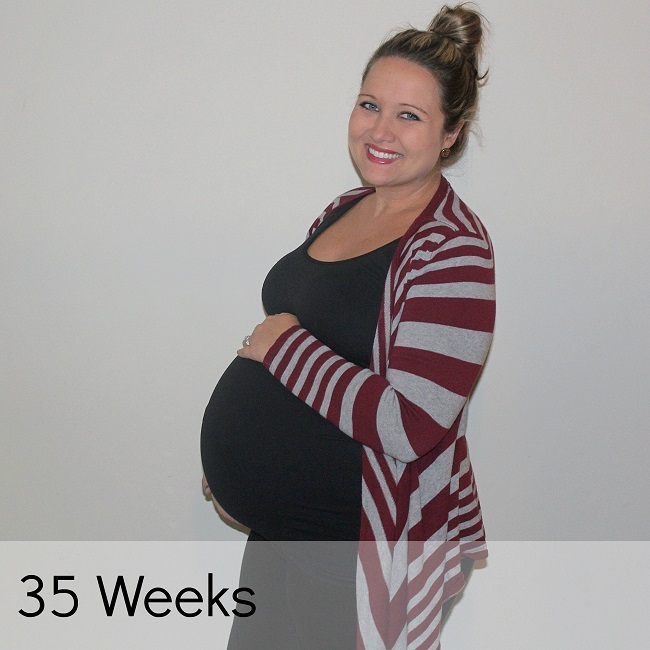 How far along: 35 weeks! Her due date is exactly one month from today! Baby is the size of: a Canary Melon. She's anywhere from 19 to 22 inches long and weighing around 5.5 to 6 pounds. She has probably already reached birth length, but she will continue to pack on the pounds right up until delivery day! Another fun fact? My uterus has grown about 1,000 times it's original size. Crazy! Symptoms: SPD accompanied by the infamous pregnancy waddle. I can tell that baby girl has started to drop because everything from my hips to my thighs are aching. I was able to slide my wedding rings back on last week, and I'm still able to wear them during the day. I think the cooler fall weather has helped with tremendously with my swelling. Gender: Our sweet baby GIRL! Movement: She definitely still has her lazy days. Thursday was a particular lazy day for my little lady. None of my usual tricks and bribes would get her moving. I was starting to get nervous and was really close to calling my doctor, but she eventually perked up for a bit and wiggled around enough so that I knew she was just fine in there. Because she is so lazy, I have been getting weekly non-stress tests during my doctor's appointment. She passed yesterday with flying colors! Nursery: It's by far my most favorite room in the house! It's so close to being finished! I still have a couple more things to hang on the wall, and then I will do a full nursery reveal. Hopefully that will be coming next week. You can see her nursery inspiration here. Steven also put together her stroller and the swing over the weekend. I love sitting in the living room and seeing her sweet baby swing across the room! Labor Signs: Braxton Hicks contractions seem to be coming a little more frequently, but they are still very inconsistent. Yesterday my doctor checked my for the first time and although I'm not dilated yet, baby girl is head down and in proper position. Steven and I also took a hospital tour yesterday, so we now know where to go and what to do when the time comes. In addition to our hospital tour, we sat down with a nurse and developed a birth plan. I love that my hospital offers this service! The nurse asked us a bunch of questions that I wouldn't have even thought to bring up, and when we left we had a little packet detailing our hopes and wishes for the birth and hospital stay. The hospital also has all that information in our file, so they will know our expectations when we arrive for delivery. Sleep: As good as can be expected at nearly nine months pregnant. Rolling from side to side in the middle of the night is pretty painful, but I'm lucky that I can still make it through most nights without getting up for a potty break. Best moment this week: Celebrating my dad's birthday at the lake with my family over the weekend and getting the final few baby items assembled! Cravings/Aversions: I'm still all about the sweets. Mood: Ready. I know I still have another four and a half weeks before her due date, but I'm so ready to meet my girl!! Looking forward to: Celebrating my birthday on Sunday! This year's celebration will definitely be much more relaxed than in year's past, but I'm excited about celebrating my last birthday before baby! Husband is: Putting up with his crazy, hormonal, and nesting wife. I know I'm driving him crazy with all my "to-dos," but he is taking it like a champ! New mommy question: Nothing new to add this week. can't believe you're so close!! So crazy!! Can't wait to meet this sweet girl! Happy birthday -- have a great time celebrating! Ahhh one more month!!! Cant wait for your reveal post :) Perhaps we can squeeze in one more happy hour before her arrival?! I love that lip color on you (ramdom but true!) She will be here before you know it! Love all the bump updates! Congrats! Oh my gosh, she will be here before you know it! These last few weeks are tough as I know you are ready to meet her and feeling like you are ready to pop, BUT ENJOY it, enjoy every little movement, you will miss them when she is in your arms even though having her there is the best thing EVER! I am even overly excited to see her beautiful face!